Can you help me identify my white porcelain antique vase with beautiful crane decoration? My photos show the crane decoration and the makers mark on bottom of my antique vase. 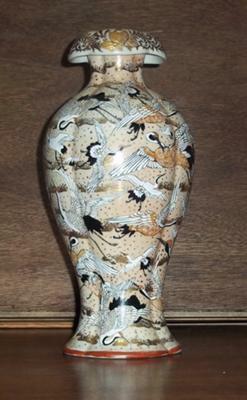 I would like to know more about this 13 inch tall white porcelain antique vase with hand-painted cranes etched in gold. I recently acquired it from the estate of an old friend and I am enclosing two photos. I can’t find a reference for the makers mark on the bottom of the vase. It’s an orange or light red flower. 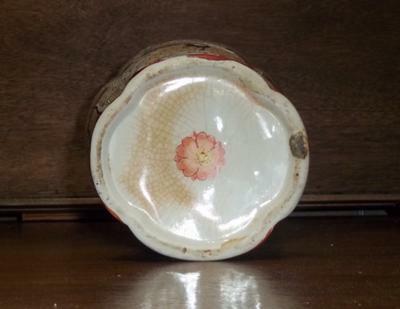 I don’t know if this antique vase is Chinese, Japanese or French or where it might have been created. I’m also unsure of the age of the piece. Can you help me identify this White Porcelain Antique Vase With Cranes etched in Gold? I would appreciate any and all information on the piece.